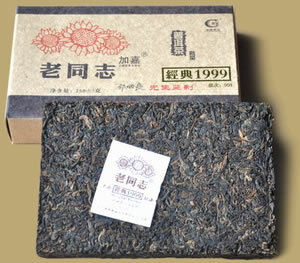 Haiwan was established in 1999, the factory has released this premium ripe Pu-erh for 10th anniversary of the founding of the factory, called "Classic 1999", prepared by Mr. Zhou Bing Liang, the prestigious Pu-erh tea expert who is in charge of the complete tea processing methods to guarantee a premium quality. This 2009 vintage Pu-erh brick weighs 250 grams, packed in a handsome box. The tea gives a deep red infusion with balanced flavor and swallows extremely well. A great gift for you or a Pu-erh lover.